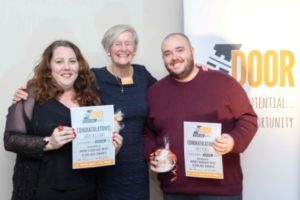 Held at the Stonehouse Court Hotel on Tuesday 27th November 2018, The Door's Annual Celebration and Awards Night was an amazing evening, recognising the young people, parents, families, staff, volunteers and stakeholders that have made a significant impact in their own lives or in the lives of their communities. Mia – The recipient of our first award this evening goes to a young person who is very creative and who often brings their homework and revision into the youth sessions they attend. They are a great role model to their friends and other young people showing that you can have the best of both worlds when it comes to school and fun. Angel – As one of our most regular attendees at our Stroud Youth Centre, this young person has become a key member of the community. It is not surprising that they received several nominations for this award, as this has been a key year for their progress. Not only has their confidence grown significantly but they have supported the development of the Stroud Youth Centre and especially recently when they got stuck in with redecoration, helped with leafleting the local area and generally looked out for the centre and staff. They were highly involved in the photo shoot, with their images being used for our latest brochure that you have in front of you. Eloise – After struggling with numerous negative influences on them, this amazing person decided to ‘take back control’ of their life. This started with them accepting support from The Door in the form of a mentor. They are now in their 2nd year of A levels, are living independently, have become a valued member of a local dramatic society, have just got an interview at Cambridge University and are looking to pursue a career in the Aerospace industry. Charlotte - In their time working with their mentor this young person has constantly challenged what they felt they could do, each time pushing themselves further. When they experienced a setback they picked themselves up and pushed again. They are now studying music therapy and helping others through difficult times too, as earlier this year they joined The Door’s team of mentors. Mandy - This parent has been in contact with us for many years. They are now constantly looking for ways to improve their home life, and we are always impressed by their openness to change and growth, facing the world head on and being a shining example to other parents. Jacquie - This next parent is again no stranger to The Door. However, more recently they have worked hard at embracing numerous challenges to make a difference for themselves and their family. They are an inspiration to other parents especially at our parent support group and their welcoming smile and attitude makes others instantly feel at ease. Catherine - Our final award in this category goes to a parent who, despite having to face many challenges this year, just keeps bouncing back, ready to do whatever is needed. We are so very proud of them and think they’re amazing. Mr and Mrs S - This family have made huge strides and achievements on both personal levels and as parents. We are so pleased to have supported them in their journey as the list of their achievements is endless. Kathleen - It is no surprise that we had numerous nominations for this person from both colleagues and young people. There are very few people who can light up a room in the way that they can. Their seemingly endless energy, passion for supporting young people and of course let's not forget that incredible laugh are truly infectious!! They will think nothing of going out of their way to help those in need, often those who others would find too challenging. 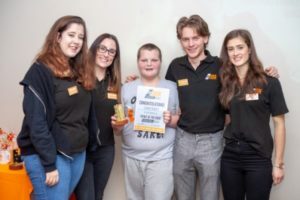 Earlier this year, they made it their business to work with and support a small yet troublesome group of young people involved in Anti Social Behaviour in Dursley. They were thrilled to have this work recognised at the Gloucestershire Police & Crime Commissioner's awards in October. Shona - It has been such a 'joy' to work with this person. Not only are they one of the most kind, gentle and thoughtful people, they also give some pretty good hugs! 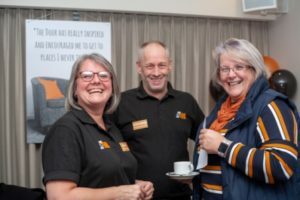 Though one of the newest members of the staff team they have been a keen supporter and volunteer at The Door for a number of years, so they have fitted in perfectly to both their role and the team. In the short time that they have been part of the team they have become THE authority at The Door when it comes to supporting parents and families. One of their many nominations said simply that they have 'an amazing heart for families'. Debbie - This person wasted no time in getting to grips with a special project last year supporting young people who are leaving care. This involved not only providing effective support to some of the most vulnerable young people in need but also building strong working relationships with social care, youth support services and other key statutory agencies, all of which they have taken in their stride. And if that wasn't enough reason for them to be given this award, they are also a thoroughly lovely person to have on the team. Victoria – And finally in the ‘staff’ category, an overdue recognition for one of our longest-serving team members, whose leadership has taken The Door to another level over the last two and a half years. This is marked by their absolute commitment to delivering an exemplary quality of service to our stakeholders, encouraging and challenging our youthwork and family support staff, never afraid to ask ‘what if’ questions or explore new ways of developing our services to ensure that we are always as ‘needs-led’ as we claim to be. Owen – This young person is such a reliable volunteer in The Door Shop – our charity shop at the top of Stroud High Street. They take their role very seriously, and even when they are having a difficult day are fully committed to providing excellent customer service. They often go the extra mile to help Anne if she’s on her own in the shop, even when they’re not scheduled to come in, and they also regularly come in at short notice. We’re very pleased to have been able to recognise how much they’ve developed by recruiting them also into a part-time paid role on Saturdays. Mike – As a volunteer this person is always ready to help out and has taken on some very challenging young people in the time they have been with us, whilst bringing a refreshing approach to those they have supported. They have also helped out in the office with some very mundane tasks and gave an inspiring talk on ‘managing anxiety’ to our volunteers’ support Group. They have such a positive manner and have come to epitomise all that we need from volunteers as well as being a really nice person to know. Karen – This next volunteer is immensely valued by the family support team at The Door. They bring a quiet strength to the families they support and their loyalty and dedication over the past 5 years is infectious amongst other volunteers in the team. And they’re always willing to volunteer to stand in the cold on a street corner with a fundraising bucket. We are immensely grateful for all that she does for us. Gemma - It's always a privilege when a young person decides to give something back to The Door especially when it's sharing a talent or gift. Over the past year this young person has faced their fear of public performance and has grown hugely in confidence. They have blown us all away with their beautiful voice, volunteering at countless street collections and concerts to raise money for The Door. Fiona - This person has been volunteering "behind the scenes" over the last year, helping out in a way which ensures The Door's reputation and impact on communities is consistent and relevant in today's society. With an amazing eye for detail, and an ability to capture the very essence of what The Door stands for, and knowing the difference that makes, they are an integral part of the professional services we present to the world. Their enthusiasm and passion for what they do is infectious, and they are able to bring the best out of those they come into contact with, helping even the most nervous of person to show their best side. Brenda and Heather – Beyond Fear Foundation – Our partnerships with external agencies come in all forms, and this next award is for an agency who, like us, supports parents with specific needs. Through going above and beyond to meet and support parents who are reaching out for help at The Door in Stroud, we have both been able to provide so many different approaches to improving home life. 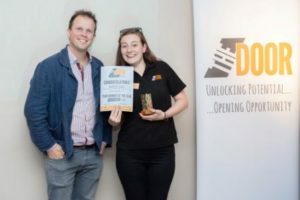 Matt and Sarah - Betaris Training – This next award goes to an organisation that we have been so pleased to partner with this year and host at The Door’s youth centre in Stroud. Providing alternative education to the most vulnerable of young people for whom mainstream education is not an option, their commitment and dedication to the work is obvious, as week by week they continue to support and educate those who find it hardest to engage. PC Lay and the Stroud Neighbourhood Policing Team – Multi-agency working is crucial for the success of any support agency whether statutory or 3rd sector. 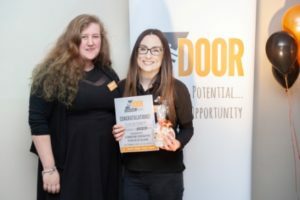 The partnership with The Door which has been driven by this person during 2018, resulted in a significant improvement in their community as they worked closely with us. This was not only a great example for other agencies to follow, but enabled a much more effective outcome for the young people and the community involved. Our work together earlier this year not only resolved an Antisocial Behaviour issue in Dursley, but also resulted in The Door being awarded the Police & Crime Commissioner’s 'Pride in Partnership award' last month. ← Volunteer This New Year!